Great view,good location,requested up floor,and gave me 16th floor as i requested! Shower cap,clean! Location excellent. The rumors and bad reviews of "no hot water" is not true. Plenty of hot water. We could see some upgrades are being made so in the future it should be better. 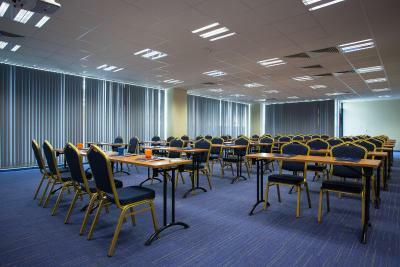 Staff was very, very friendly and helpful, the room was clean, and had a wonderful view of downtown Sofia! It was clean in the room, they put my baggage in a special room, the receptionist lady was polite. There was a extra couch that could accommodate another person. The hotel has excellent location. Stayed on the 5th floor, in the newer portion. Huge room, Bathroom was very nice with the largest assortment of toiletries I have ever seen. Bed was thin but fairly comfortable. Huge windows with a great view. Some noise from the traffic below. Didn't make it breakfast but it was included. Great location, friendly staff, nice lobby. The room size was comfortably adequate with a superb view overlooking Sofia. 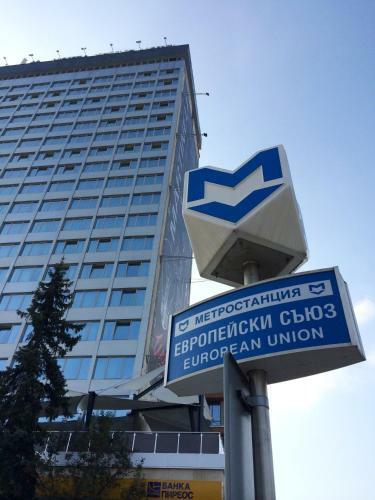 The hotel is just 30m from a metro station, which makes moving very easy. The underground garage is also very handy providing a good solution to the difficulty of parking in the streets of Sofia. 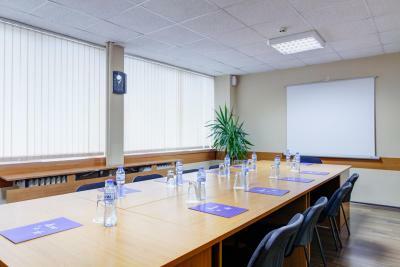 Hemus Hotel Sofia This rating is a reflection of how the property compares to the industry standard when it comes to price, facilities and services available. It's based on a self-evaluation by the property. Use this rating to help choose your stay! 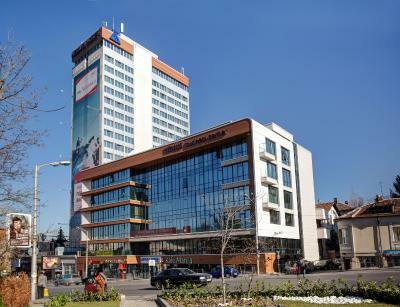 Located opposite the City Center Sofia shopping center, Hotel Hemus provides elegant rooms with mini-bars, cable TV and free internet access. 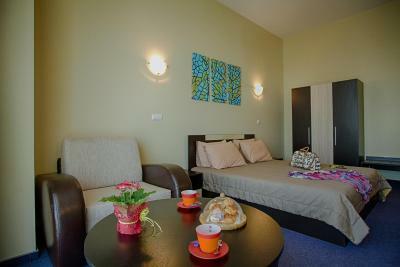 Each of the rooms features individually-controlled air conditioning. 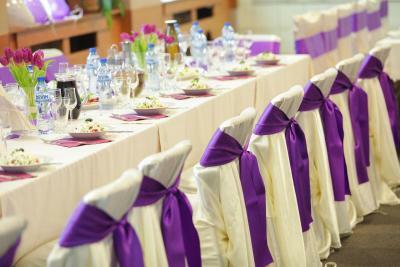 The elegantly decorated restaurant serves international cuisine and local dishes. 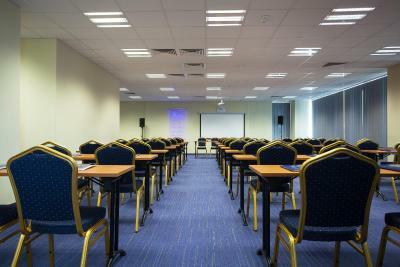 An on-site casino and a night club, as well as conference rooms are provided in the 2 buildings of the Hemus Hotel. Parking in the guarded garage parking is possible for an additional charge at the Hemus Hotel Sofia. The European Union Metro Station is located next to the hotel. 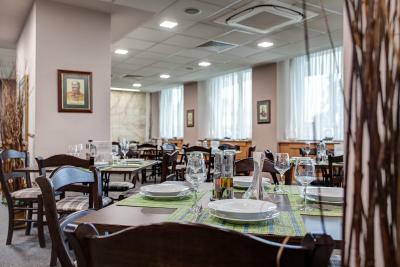 Hotel Hemus is within easy walking distance to the National Palace of Culture and Alexander Nevski Cathedral. 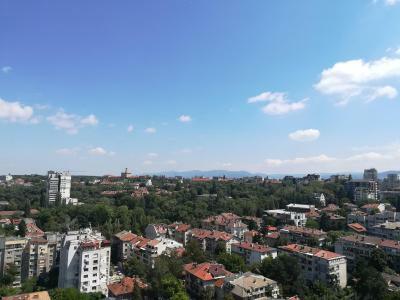 The popular Vitosha Boulevard with many shopping possibilities is 2,300 feet away. 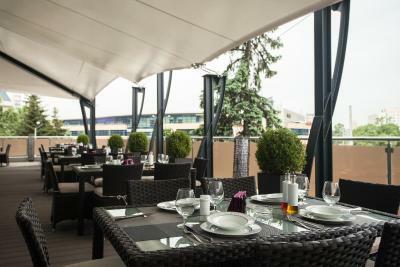 When would you like to stay at Hemus Hotel Sofia? Private parking is available on site (reservation is not needed) and costs BGN 15.06 per day. This spacious suite has a separate living room with a sofa bed and a cable TV. Located in the Business Center Hotel Hemus, built in 2013, the individually controlled air-conditioned suite comes with panoramic windows with city views. Featuring a high speed WiFi, flat-screen TV, a mini bar and a private bathroom with a bathtub. Some of the units have a private balcony. This double room has a mini-bar and cable TV. Please note that some units are with 2 adjacent single beds and some are with 1 double bed. 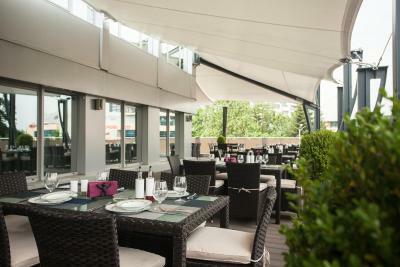 House Rules Hemus Hotel Sofia takes special requests – add in the next step! One child under 12 years is charged BGN 9.78 per night when using existing beds. Hemus Hotel Sofia accepts these cards and reserves the right to temporarily hold an amount prior to arrival. The flooring of the room could accept some improvement, as this would add to the overall comfort. Room needed some minor maintenance works. Great location, good value for money, good underground parking and friendly staff. The room was used for smoking so I don’t like that. Except the smell of cigarettes everything was good. The location is great, I was on upper floor so had view. Coffee worth it. The bathtub was just put against the bathroom wall, without any sealant, and the that was splashing on the wall was straining on the bathroom floor!!! The installer must had been either drunk(!) or too lazy to do the job right! Spacious with amazing view from the top floors. Frienly staff, great location. The room and the view. Dirty room, lack of towels and hairdryer, poor heating (Aircondition). Lack of hot water during the night. Disgusting bathroom and bad noise insulation. In order to take a shower, we had to wait more than 10 minutes for a hot water every time. It was supposed to be a no smoking hotel/room. However the room had an ashtray and a strong smell of cigarettes. So for a nonsmoker I found it hard to relax and sleep in the room. Good location, nice view, decent size room.